Photo by Adrià Goula Sardà. 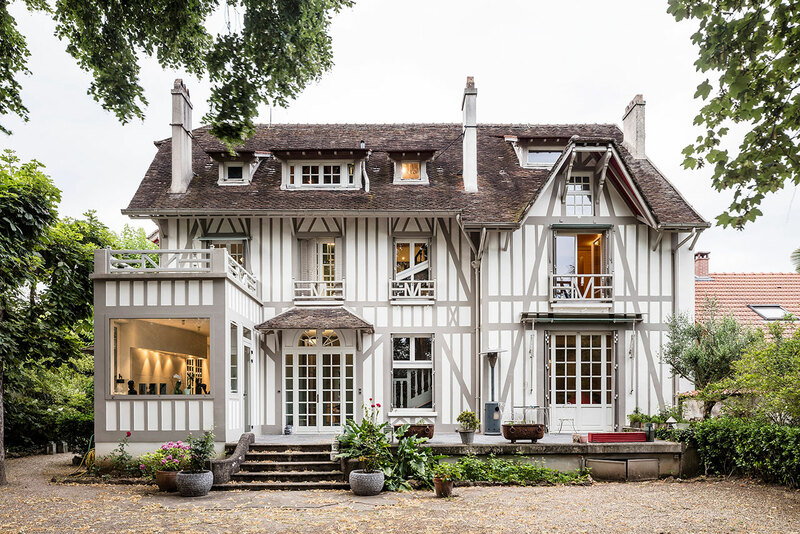 Located in La Varenne Saint-Hilaire, a leafy suburban neighborhood of Saint-Maur-des-Fossés in the southeast of Paris -a historic commune almost entirely encircled by the river Marne, which grew around a 7th century abbey of the same name- “Maison à Colombages” is a late 19th century house for a family of four. 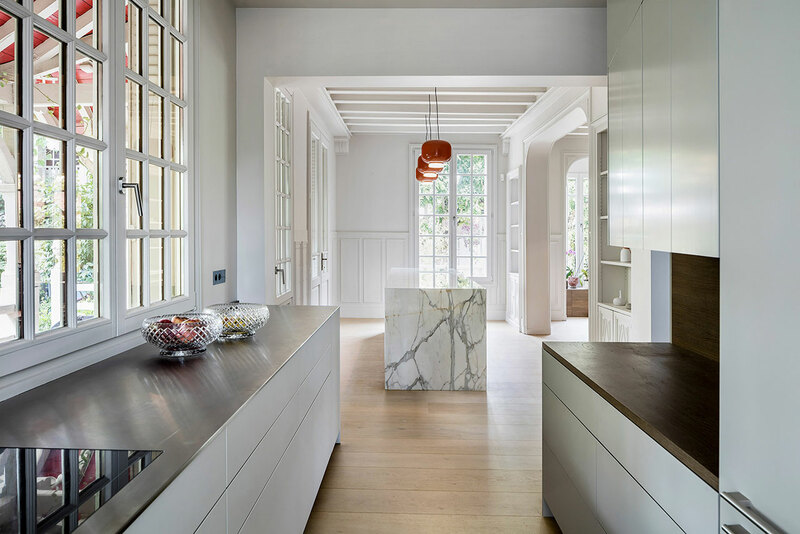 Artfully restored by Joan Arnau Farràs and Carme Muñoz Ramírez of Spanish studio 05AM Arquitectura, a fine balance has been struck between its original, period character and the requirements for contemporary living through a design of understated elegance. The name of the house, Maison à Colombages, denotes a construction technique known in English as half-timbering or Fachwerk in German, consisting of timber frames with plaster or masonry materials filling in the spaces between the wooden beams -the “half” refers to the wooden cylindrical logs being cut in two- easily recognized by the exposed timber framing on the building’s façades. The method became popular towards the end of the Middle Ages and again during the Tudor Revival in the late 19th century; although by that time it signified a decorative rather than a structural statement when this house, as well as many others in the neighbourhood were built, and the architects have stayed true to its aesthetic. 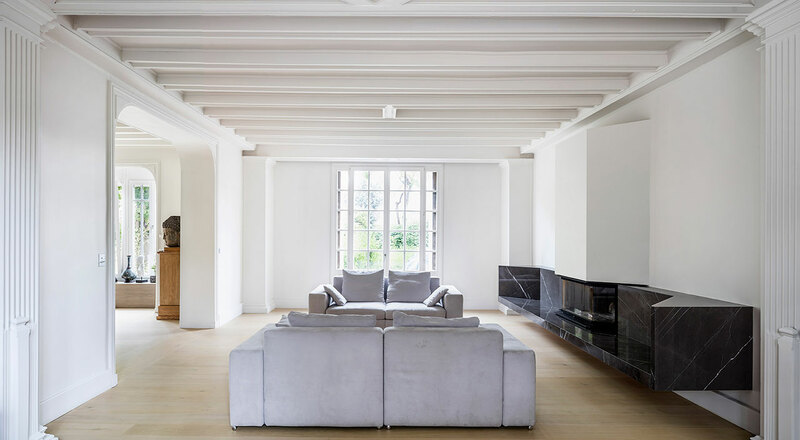 So while the exterior has been carefully restored to its original design, in painting the timber elements a light shade of grey, the architects have cleverly avoided making it look dated, opting instead for a romantic, light-weight elegance. The "colombages" woodwork, or half-timbering, became popular towards the end of the Middle Ages and again during the Tudor Revival in the late 19th century. 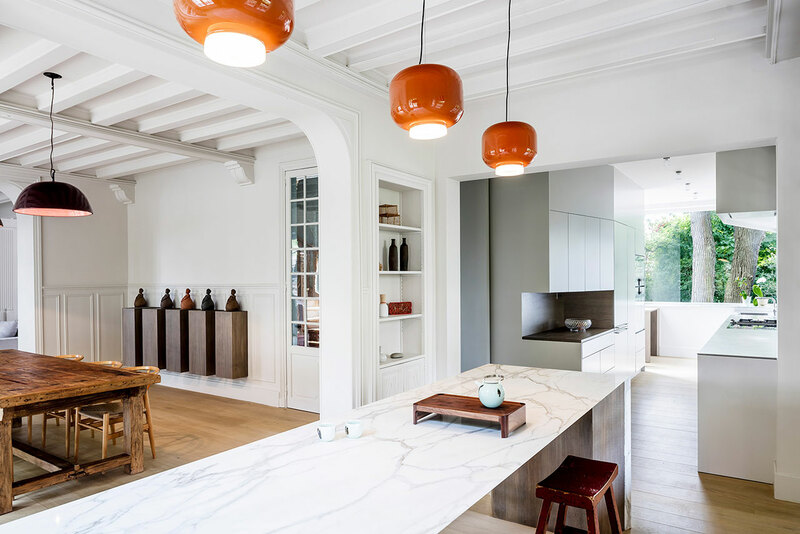 Similarly for the interiors, the design has retained key elements of the original layout and decoration that give the house its distinct character, and disposed of or added others for the sake of uniformity and functionality. 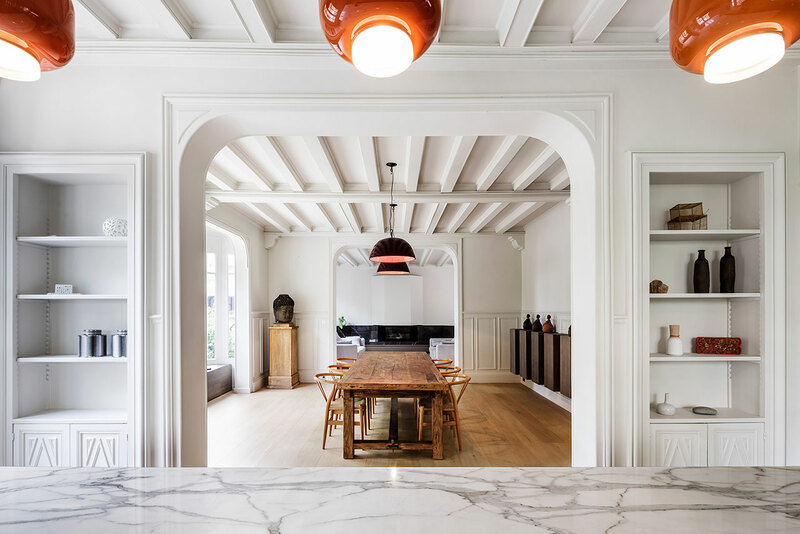 Ornate ceilings on the ground floor and wall moldings throughout the house have thus been restored and painted off-white and the corner fireplaces on the first floor have been revamped. 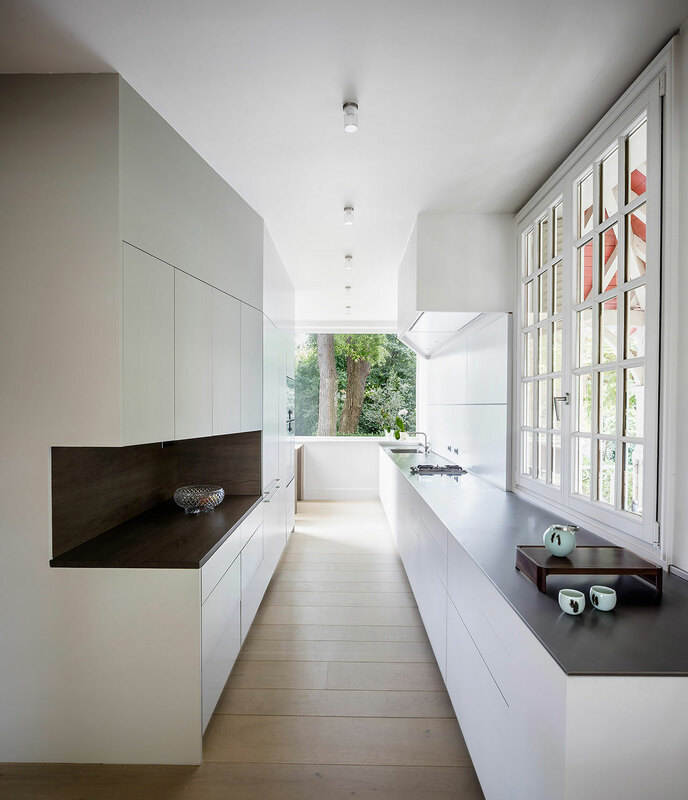 Layout-wise, the original design of the living spaces on the ground floor that flow into each other has been retained and taken a step further by removing a partition wall that separated the kitchen, while a wardrobe and guest bathroom have been added to separate it from the entrance. 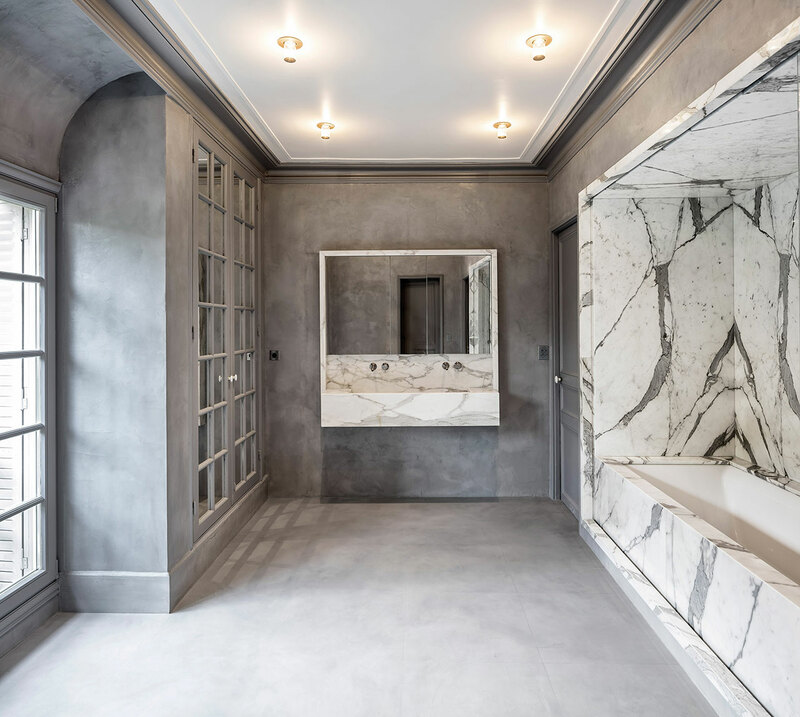 The designers have also taken advantage of the existing alcoves found in the first floor to recess the beds in both the master and the children’s bedrooms and incorporate a bathtub and shower. 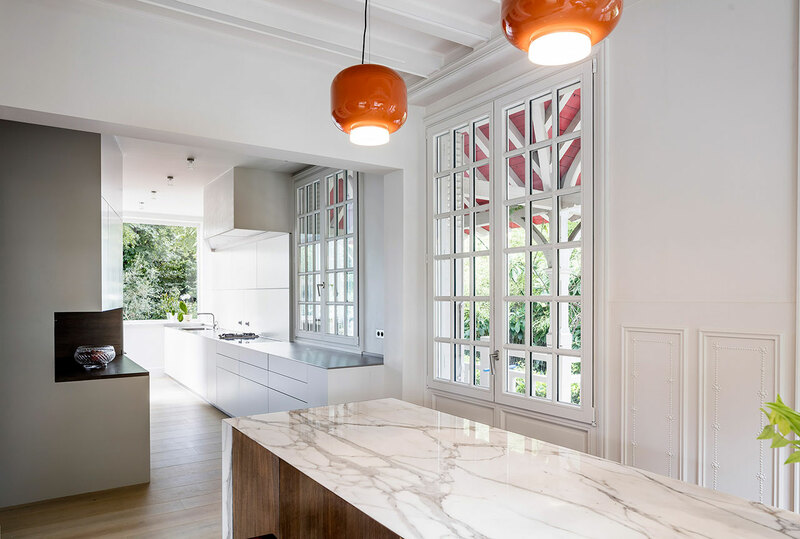 The minimal, all-white aesthetic of the interior décor is complemented with accents of monochromatic marble and natural wood as well as zones of color. 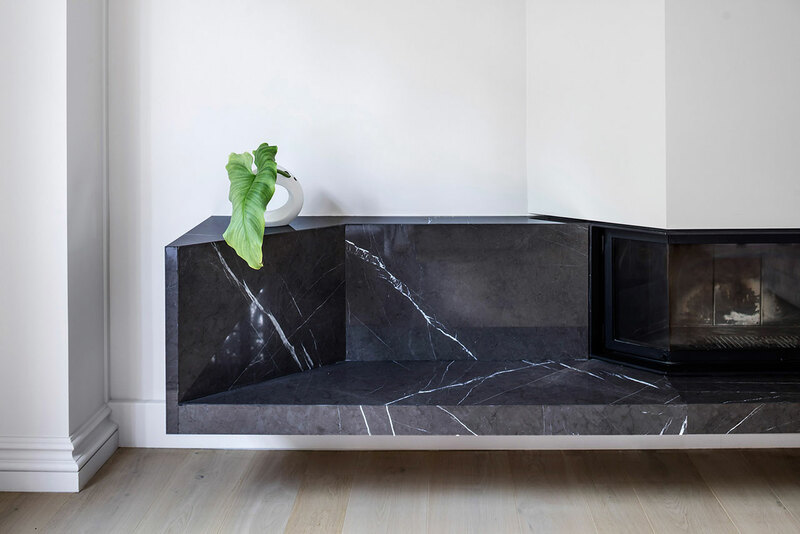 On the ground floor the prismatic dining counter of streaked white marble, beautifully treated with a wooden underside, dominates the space without imposing, while the cantilevered block of black marble that incorporates the fireplace in the opposite room provides a visual counterbalance, a yin to the counter's yang. 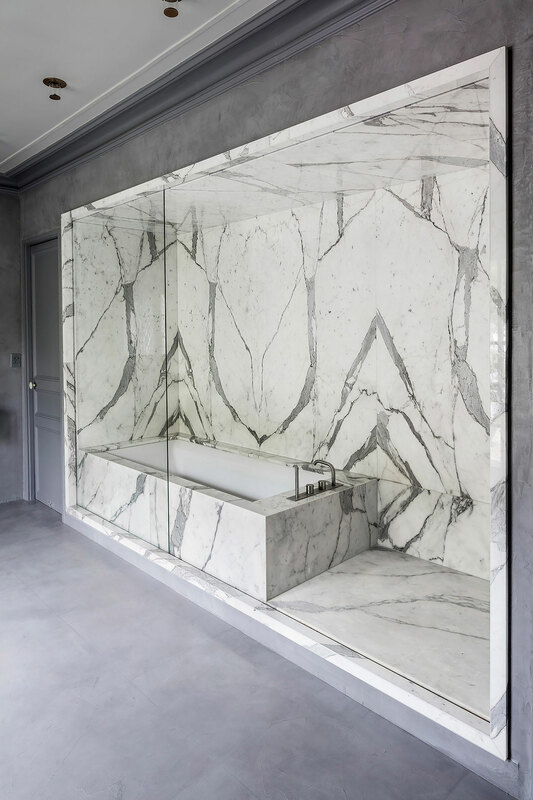 White marble has also been used to clad the alcove incorporating the bath and shower in the master bathroom as well as for the sink and mirror, artfully complemented by painting the rest of the space a mottled dark grey. 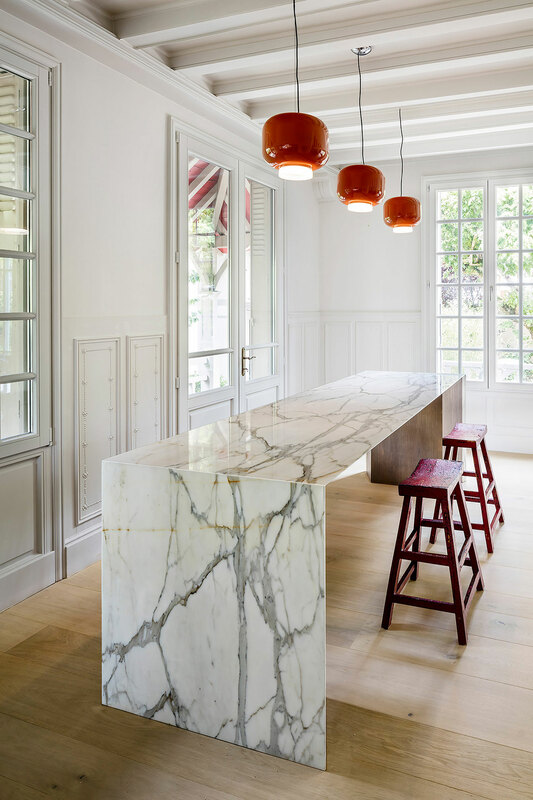 The marble elements give the house a sense of subtle luxury whereas the timber accents, including the rustic wooden table in the central room and the main wooden staircase, provide a more homely ambiance. 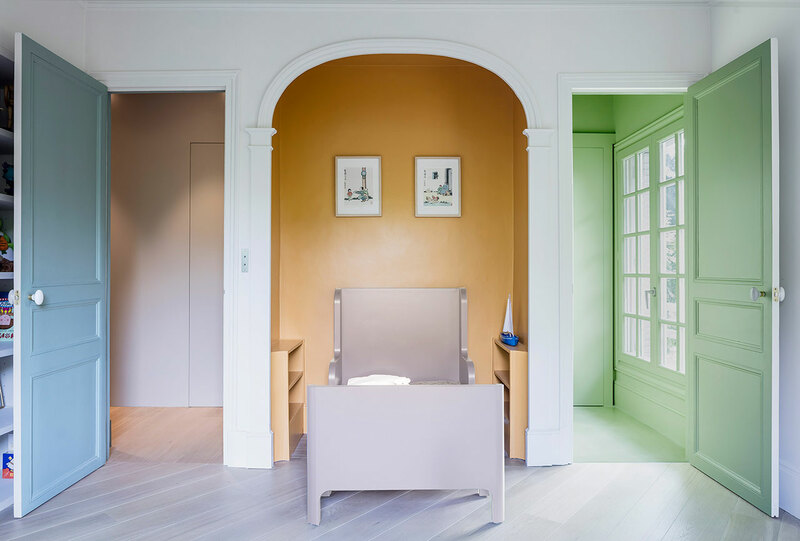 In the children’s rooms, the accents are more playful with the alcoves painted ochre or ocean blue and the en-suite bathrooms yellow or mint green correspondingly creating complementary combinations. 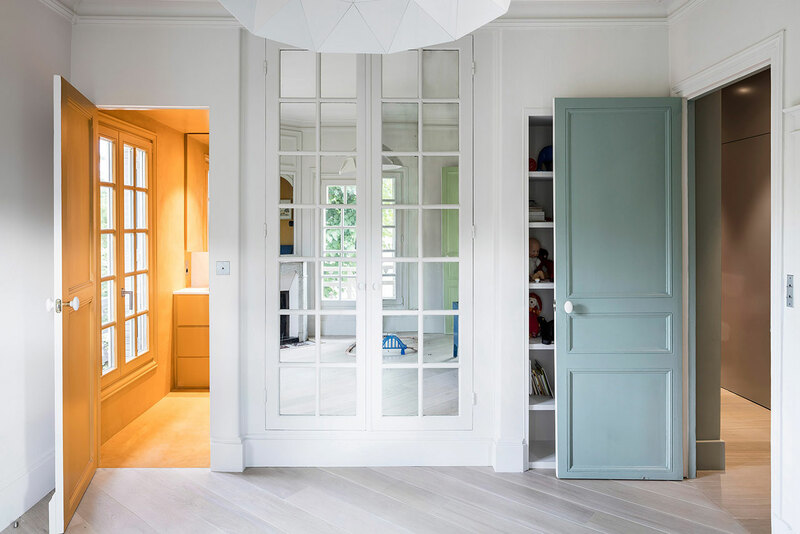 The designers have taken advantage of the existing alcoves found in the first floor to recess the beds in the bedrooms. 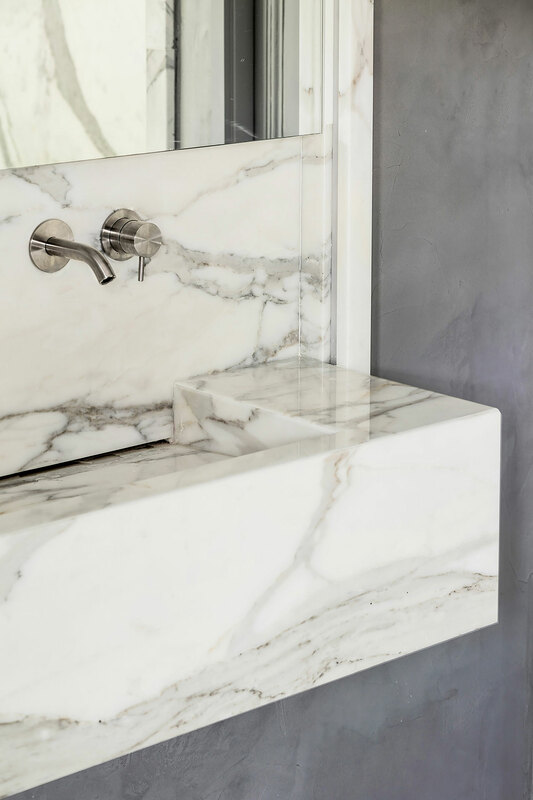 The minimal, all-white aesthetic of the interior décor is complemented with accents of monochromatic marble and natural wood as well as zones of color.